My nena was once nicknamed “Cowgirl” by her father. She was a tough little fireplug who wore pants and t-shirts most of her first three years and then she discovered sparkle and skirts that spin. “Cowgirl” is no more. She’s still a tough chick, but a chick who toughs it out in dangly jewelry, tiaras and tutus — even at Target. 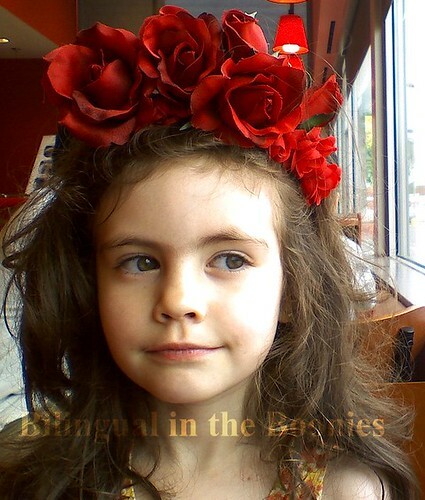 Today, La Maria reminds me that it would be nice never to outgrow a tiara, or a Frida-inspired rose-covered headband. Full post over at Parenting.com. Un beso to you all this weekend. OMG! Maria is such a beauty! Those eyes, always with a knowing look…girl, you are in for trouble when she’s a teenager! Creo heredo algo de su abuelita,que divino! A rockin’ headband…totally Frida-esque with plenty of attitude! I echo the other Mamis…gorgeous little girl- and you can tell, she’s got her mommy’s attitude! Gracias…she is pretty cute! And that is what saves her half the time…Fortunately, she has brains to match. And evenshine, attitude-wise, the apple doesn’t fall far from the tree, I do regret.